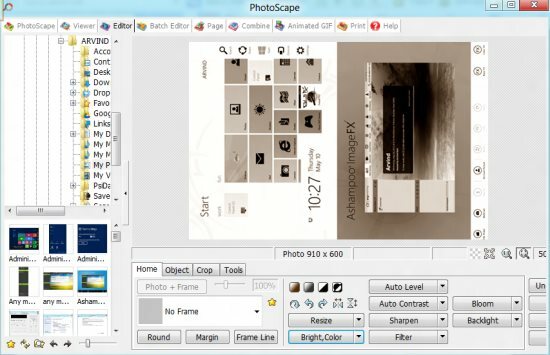 Yet another good utility software we tried, PhotoScape. A desktop photo editing software that facilitates you with viewing photos, editing photos, resizing photos, renaming photos, give various amazing effects to images, and many more. In addition, this free photo editor also supports RAW conversion and comes up with pre-built templates to let you create collages, Web-comics, and provides facilities for red-eye removal, shadow removal, and the like. Installing PhotoScape Image Editor in Windows 8 is very much similar to how to do it in other popular Windows. However, before I jump down to its downloading process, let me quickly jot down its features below. It will take you to a page from where you can download “PhotopScape”. Hence, you need to click on “Download” once again to complete your downloading process. Do not miss out our post on PhotoOnWeb to Host Images In Windows 8. Yup..you have successfully installed PhotoScape Image Editor in Windows 8. Go ahead and give it a try yourself in Windows 8.